From Foaty I proceeded to the town of COVE; delightfully situated on the south side of the Great Island. The town, which is neatly built, has a busy, lively look, and is cleaner than the generality of seaports. It can boast but few objects of antiquarian interest, being merely an insignificant village at the beginning of the present century; its subsequent importance has been in a great degree owing to the late war, during which Cork harbour was made a rendezvous station for the British navy. But the town owes its greatest celebrity to the mildness of its climate and its excellent situation, being open to the sea on the south, and encompassed on every other side by high hills, which effectually shelter it from the cold winds. This happy position, and the picturesque beauty of its environs, have for many years past made it a favourite resort for numbers of invalids, who, as a medical writer  remarks, "would otherwise have sought the far-off scenes of Montpellier or Madeira, with their vehement suns and less temperate vicissitudes of climate. The many recoveries here have justified the selection, and proved the restorative and invigorating principle of its atmosphere. 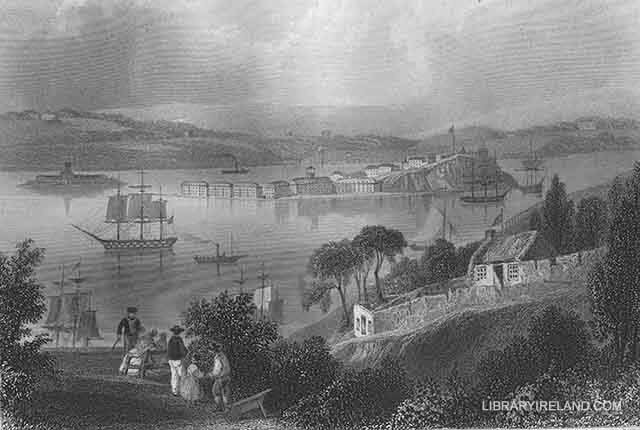 An admirable equability of climate, and an absence of sudden and violent interruptions, are the great characteristics which have so beneficially marked out this town to the ailing and debilitated, and established its reputation." From the steepness of the site on which the town is built, the invalid is afforded a variety of climate, tempered to his wishes, and attainable according to the elevation of the different ascending terraces; and for all purposes of exercise, the neighbourhood abounds with exhilirating walks and drives. 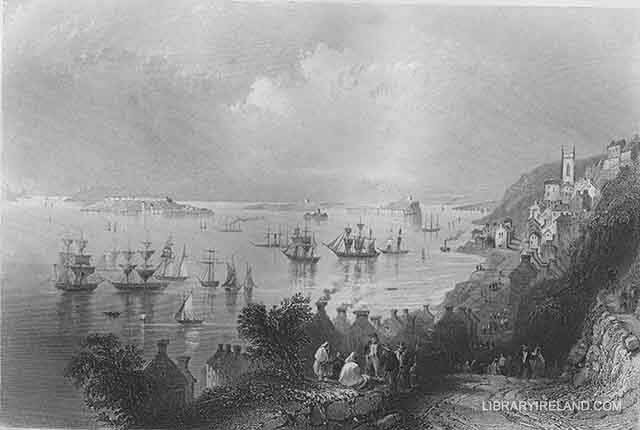 But it is not to the valetudinarian alone that this spot offers attractions; its proximity to Cork, the beauty of its scenery, and its favourable situation for sea-bathing and for boating excursions, draw a great influx of gay and fashionable visitors here during the summer months. The town, as I have observed, is built partly on the margin of the shore, and on the stages of the steep hill that overhangs the harbour. It is from these terraces that the most extensive prospects over the harbour may be obtained, and, undoubtedly, it is a noble sight to look down upon the broad expanse of that land-locked haven, with its fortified isles, encompassed by lofty hills, crowned with numerous villas and mansions: and should, as is frequently the case, a fleet be lying at anchor under the shelter of the land, nothing can be conceived more lovely and magnificent than the effect of the coup d'oeil. In the valley, to the rear of the hill which overlooks the town, is the small ruined church and burying-ground of Clonmel. A large proportion of those interred beneath are strangers: many a storm-tossed mariner lies there, who has struggled with death upon the ocean, that he might breathe his last upon the land, and instead of the dark billows rolling over his cold remains, have the bright green grass and the young flowers springing from his grave. Many a youthful victim too, whom fell consumption had marked for its prey, but who, with self-deluding hope, sought too late to arrest its progress in this mild and genial climate, has found his last resting-place in that lonely churchyard. In this cemetery reposes the mortal part of the Rev. Charles Wolfe, an elegant though almost unknown writer, who, in 1823, at the early age of thirty-two, died in Cove, whither he had removed for the benefit of its air. He was the author of the Lines on the Death of Sir John Moore, which, had he never written anything else, was sufficient to stamp him as a poet of the highest order. Here also, in an undistinguished grave, is buried "Tobin," the author of the popular comedy of The Honeymoon, who died in the harbour on his passage to the West Indies. Since the accession of her present Majesty, the ancient name of Cove has given place to that of Queenstown; which title the town received upon the occasion of the Queen landing there in 1849. Dr. Scott, of Cork, whose Medical Topography of Cove is in the hands of every invalid visiting this place.